Paul Thomas Anderson’s first documentary, Junun, plunges the viewer into an immersive bath of rapturous sound that is both entrancing and soul-stirring. With scant instances of narrative signposts or dialogue to explain the circumstances being filmed, Anderson lets music drive the story leaving no choice but to experience the sonorous, epic elegance of this special film. Junun follows the recording sessions of a music collaboration between Western musicians - Jonny Greenwood of Radiohead, producer Nigel Goodrich and composer Shye Ben Tzur - and their Eastern counterparts - a brass band collective known as the Rajashan Express. This cultural exchange is at once improvised and rehearsed, structured and meandering, energetic and languorous, creating and composing in tandem, and in tension, a glorious expression of music which envelops the room with energy and inspiration. Filmed behind the walls of an ancient fortress in Rajasthan, India, the lifeblood of music courses through its people and culture with force and purpose . Anderson doesn’t try to hide his or his crew’s presence as Western observers, or the pretense of filmmaking in Junun. The visual style is unaffected, with long takes moving in and out of focus, run-and-gun camera action, production gear strewn around the room, and the occasional sound blooper at the fault of an ardent band wanna-be in the form of a relentlessly cooing pigeon. The film maintains a wabi-sabi balance that allows the viewer to embody this wonderfully infectious music, while experiencing the essence of what cannot be spoken, but only heard and felt. Go see it, or at the very least buy the album when it comes out next month! I'm back!!! Woodland creatures, plants and other fun tidbits. It's been a while since I've posted on Iheartlist! I was trying to make my mark in the world of tech startups for the past couple years. The mark was more like an unseemly mess of scratches after many awkwards attempts to grasp at a glittering thingy that would wickedly swing away from my reach. Now I'm back to searching for inspiration and wending my way into some new adventure. So for now, I'll be posting objects, concepts, environments and experiences that inspire me. I've heard that people get a puppy before having a baby to test their threshold for responsibility and patience. I'm getting a few plants, before I get a puppy. If I can't throw some water into some dirt and move a pot into the sunlight, I'm definitely not worthy of mothering an impossibly devoted and fluffy corgie named Rufus that sweetly snores on a Hudson Bay blankey around my feet. I've been looking for planters for my window sills. Medium sized, 5-7 inches with drainage holes. 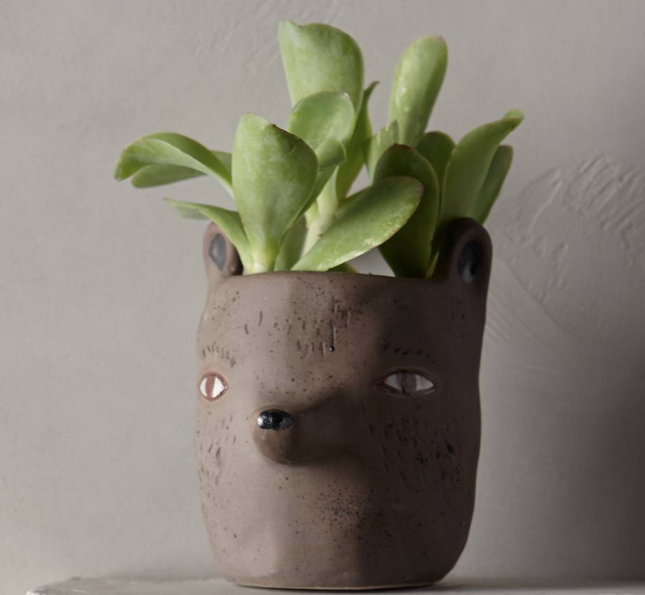 Pottery makers of the world, you have a lazy bias for succulents, because I've searched up and down the internets and cannot find a pot to plant in. I did however find these adorable little woodland creatures designed by Sarah Burwash. Integrating motifs of nature into her work, her pieces are at once modern and nostalgic, playfully rendered, straight out of a fairy tale. These little pots come in Fox, Bunny, and Bear. Oh my!